Analysis of the captured gases found more than 25 volatile organic compounds, including seven hazardous air pollutants, coming out of the vents. Of those, two chemicals – acetaldehyde and benzene – are classified by the Environmental Protection Agency as carcinogens, for which the agency has established no safe exposure level…Emissions from the top five brands, they estimate, would constitute about 6 percent of automobiles’ acetaldehyde emissions. Puts “mountain fresh” scent into a whole new perspective, doesn’t it? Longtime readers know I violently hate leaf blowers. I still can’t believe most people regard these infernal shrieking monsters as a “normal” part of life. There’s always one blasting away in my neighborhood, destroying the peace and quiet. I’ve noticed that the amount of work being done with them is often minimal or downright imperceptible compared to the public disturbance they cause. I swear, my neighbor just enjoys waving his blower around like a metal detector as he strolls through his perfect grass. And yet we can’t necessarily see the crud they spew into the air, or the sound waves radiating out for blocks, so it’s all good, man. 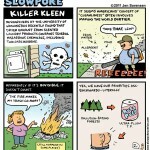 For more on the ultra-plush toilet paper issue, Greenpeace has been on the case. I’m not a TP radical, but I’ve always been of the opinion that super-soft rolls run out too quickly. PS: A Daily Kos commenter linked to an article about these awesome Japanese toilets. I want one. 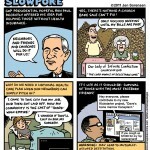 The more I think about Ron Paul’s solution to the plight of the uninsured, the more baffled I become. So, churches are going to come to the rescue? That would seem to leave an awful lot of non-churchgoers to die, but maybe that’s the point. And what about, as the Beatles put it, all the lonely people? These same politicians calling for communities to pitch in together are the ones pushing the myth of the radically-atomized individual. They are the party of American alienation: inhuman-scale corporate bureaucracies, big-box stores, unchecked sprawl, barricaded McMansions, and oversized vehicles with outside-world-avoiding names like “Enclave.” (I generalize, but only slightly.) These are the people who crush attempts at fostering community through urban planning and the creation of public space. For these ideologues to lecture anyone about neighborliness takes a lot of chutzpah. Not even Ron Paul’s muffin-based health care plan could help his former campaign manager who died with $400,000 in medical bills. He was reportedly ineligible for health insurance due to a pre-existing condition. (For an eloquent statement on this, and general Republican cruelty regarding health care, I recommend this Daily Kos diary). 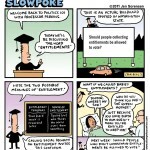 A note about the Kickstarter joke in the fourth panel: I had a nagging feeling that I’d seen a tweet about Kickstarter-funded health care somewhere, but a rather lengthy search turned up nothing. In any case, I apologize if I’m not the first person to think of that. Clearly the sign is the handiwork of an ignoramus, but it touches on something that’s been bothering me for a while. Many Americans don’t understand the term “entitlements.” Anyone hoping to preserve the social safety net should avoid the word, which makes Social Security and Medicare sound like frivolous handouts to undeserving snots. The fact that anti-poverty measures like food stamps are also referred to as entitlement programs only adds to the confusion, not that denying voting rights to poor people is any less reprehensible. I wouldn’t dismiss this billboard guy as a lone crackpot, either. TPM recently reported on conservative columnist Matthew Vadum, who suggested that registering poor people to vote is like handing out burglary tools to criminals. I smell a meme. I leave tomorrow for the 2011 Small Press Expo in Bethesda, MD. I missed the last two, so I’m looking forward to reliving my old Fall ritual again (I used to go every year). If you’re in the area, stop by my table. I’ll be signing books and will probably have some prints on hand as well. I’d tell you the table number, but there might be some reshuffling due to earthquake-related repairs to the hotel, so you’ll just have to find me. In related news, here’s a Washington City Paper interview with me in advance of the show. Many thanks to the estimable Mike Rhode. 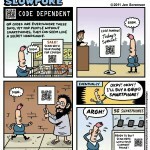 Coincident with this week’s cartoon, there’s an ad in rotation on that page with a BIG QR CODE! I’m almost embarrassed to admit this as a media-type person, but I still do not own a smartphone. My rudimentary cellphone has become a perverse point of pride for me. I figure I’ve saved thousands of dollars over the past few years, so why stop now? Plus, I work from home, where there’s plenty o’ internet. Too much, in fact. Oh, I’m sure I’ll get an iPhone eventually… once they’re considered the Atari of mobile technology. But these QR codes popping up everywhere, readable only by people who own a Secret Decoder Ring, seem just a little, well, exclusionary to those of us who are frugal with our phones. This will almost surely lead to a greater incidence of Cellphone Inferiority Complex.